I wrote about ceilings last week, this week I’m assessing internal walls, so take a long spirit level to gauge how flat, plumb and level the walls are. Doorways with unlevel heads may indicate settlement or subsidence. Another common indicator is wallpaper with diagonal creases where two walls meet. This can happen with any type of wall construction, and indicates that one wall has moved down relative to the other since they were papered. There will probably be diagonal cracks in the plaster underneath too. This isn’t necessarily a major problem in older, pre-building-regs houses with shallow foundations but which have stood the test of time. Particularly if the paper has been on for decades and hasn’t moved much. If unsure, get an engineer’s report. As I said in my blog about surveyors, for specific concerns an engineer is better than a surveyor’s report, as an engineer doesn’t just trouble-shoot but can suggest solutions as well. As with ceilings, timber-framed internal walls come in two main types (plasterboard and lath-and-plaster). Walls may also be single-skin brickwork which I’ll cover next week. Lath-and-plaster walls on a timber frame are subject to the same problems as ceilings which I discussed last week, except without the danger of concussing occupants by falling on their heads! They are easily damaged by impacts, the thin wooden laths flex on the frame, causing plaster to crack and fall away. Try pressing any indented bits with your fingers. If it moves easily it needs to come off and be replaced, either with a plasterboard patch or if more than about 10% of the total area then the whole wall. It’s not a big job, but skirting boards and architraves may have to come off, so get quotes. If lath and plaster walls are in good condition and bare of paper and paint, but just a bit rough, they can be revived with a quick skim of plaster (surprisingly, quicker, cheaper and better than lining paper). In many older houses timber-frame walls were built straight onto stone or concrete floors with no damp-proof-membrane (DPM) and eventually become riddled with rot and woodworm. If suspect, try the key test – pushing a long key (or screwdriver) into the bottom of any wood showing. If it yields easily, it’s rotten. 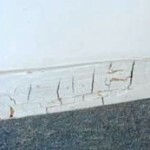 If it shows signs of cuboidal cracking, it may have dry rot. The solution to the damp is to remove it all and replace on a plastic DPM to stop the damp. Dry rot is a bit more involved. Little known fact – woodworm is also associated with damp. If you install central heating and reduce the relative humidity in the house enough, woodworm will die too. All creatures need moisture and if you deprive them of it completely they can’t survive. That’s why they congregate where timbers are damp. As with ceilings, plasterboard walls should present fewer problems, so long as there are enough fixings and it’s dry. Second little-known fact – timber walls can be load-bearing. Many times I’ve used a 4” x 2” timber frame wall to carry the floor above for a loft-conversion, to the complete satisfaction of the Building Inspector. If planning to remodel the house, don’t assume you’ll be able to pull out timber walls without putting in some kind of support for floors and walls above! I’ll do solid internal walls next week.